Last Friday night was the first installment of this season’s monthly Review Panel at the National Academy Museum, a series that consistently ranks among the few not-boring art panels in the history of the Universe. This time, as usual, moderator David Cohen stirred the pot, while panelists David Carrier, David Brody, and the razor-sharp Linda Nochlin (whose feminism, with her insistence on the word “germinal” rather than “seminal,” has not flagged) weighed in on four current gallery exhibitions: Maya Lin, Chris Ofili, Kehinde Wiley, and Janine Antoni. 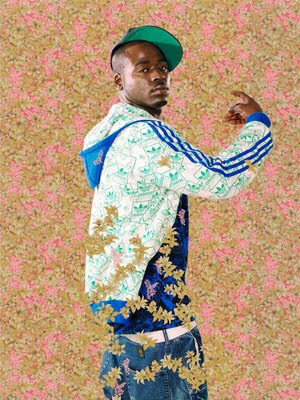 Kehinde Wiley, After John Raphael Smith's A Bacchante after Sir Joshua Reynolds, 2009, Photograph, 31 5/8 x 39"
The last two contained examples of “art about art”: Most of Kehinde Wiley’s photographs are examples of young Black hip-hop guys in the same pose as famous women from art history (odd that no one mentioned Robert Colescott here), and Janine Antoni’s refers to, among other things, Louise Bourgeois’s multiplicitous spiders. Janine Antoni, Inhabit, 2008, Digital C-print, 116 ½ x 72”. I want to see art that’s powerful enough to keep me in the experience all on its own, not as a comment on something else, and not something that I have to bring extraneous information to—such as the “artist’s intention”—in order to “get” it. Or, to put it another way, reference to other art, or anything outside the work itself, triggers an intellectual response that can get in the way of an emotional one. It offers only one interpretation, which makes for a closed circuit, rather than serving as a stimulus to the viewer’s imagination and opening it up to myriad possibilities. “Art about art” is a lose/lose situation: if artists are better than those they reference, the citation only drags them to a lower level—and if they’re not as good (somewhere I think I used the example of David Salle’s paintings after Chardin) then all the viewer can think about (after “Oh yeah, Chardin”) is how they’d rather be looking at the original..
Kehinde Wiley, After Jean-Bernard Restout's Sleep, 2009, Photograph, 30 5/8 x 49 1/8"